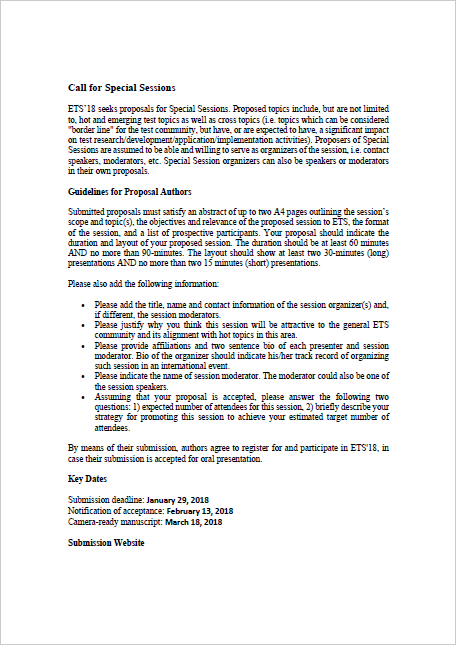 ETS'18 seeks proposals for Special Sessions. Proposed topics include, but are not limited to, hot and emerging test topics as well as cross topics (i.e. topics which can be considered "border line" for the test community, but have, or are expected to have, a significant impact on test research/development/application/implementation activities). Proposers of Special Sessions are assumed to be able and willing to serve as organizers of the session, i.e. contact speakers, moderators, etc. Special Session organizers can also be speakers or moderators in their own proposals. Submitted proposals must satisfy an abstract of up to two A4 pages outlining the session's scope and topic(s), the objectives and relevance of the proposed session to ETS, the format of the session, and a list of prospective participants. Your proposal should indicate the duration and layout of your proposed session. The duration should be at least 60 minutes AND no more than 90-minutes. The layout should show at least two 30-minutes (long) presentations AND no more than two 15 minutes (short) presentations. Please add the title, name and contact information of the session organizer(s) and, if different, the session moderators. Please justify why you think this session will be attractive to the general ETS community and its alignment with hot topics in this area. Please provide affiliations and two sentence bio of each presenter and session moderator. Bio of the organizer should indicate his/her track record of organizing such session in an international event. Please indicate the name of session moderator. The moderator could also be one of the session speakers. Assuming that your proposal is accepted, please answer the following two questions: 1) expected number of attendees for this session, 2) briefly describe your strategy for promoting this session to achieve your estimated target number of attendees. By means of their submission, authors agree to register for and participate in ETS'18, in case their submission is accepted for oral presentation. Upon acceptance, special session presenters can prepare a single paper up to 10 pages for the entire session, to be included in the formal proceedings. For more information, please contact the Special Session Chairs, Stephen Sunter, and/or Jerzy Tyszer.